To read our article: Why Did Horned Dinosaurs Have Fancy Frills? The researchers conclude that there is no statistical evidence to support the idea that the elaborate horns, neck frills and bony outgrowths associated with the skulls of the Ceratopsia evolved to help with inter-species recognition. 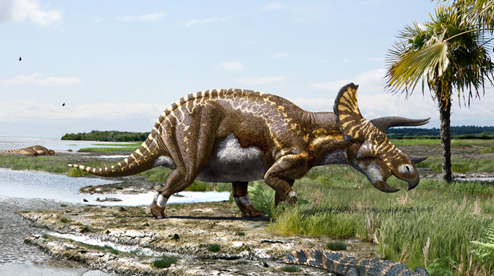 If a Centrosaurus (Centrosaurus apertus), happened to encounter an Achelousaurus (A. horneri), then it is likely that they used more subtle signals to help distinguish themselves. Although, inter-species recognition is discounted, the paper suggests that the amazing skull ornamentation evolved as a sign that the individual was genetically healthy and therefore an attractive mate. Triceratops was one of the last dinosaurs to evolve and its horns probably played a role in demonstrating fitness for breeding as well as defence. How Many Horned Dinosaurs and When Did They Live? Before the statistical analysis could be carried out, the dedicated research team had to create a pool of horned dinosaur data to work with. To test the idea about fancy frills and huge horns having something to do with inter-species identification, the scientists had to work out when the species of horned dinosaur lived, where they lived and what other horned dinosaurs shared their habitat. In essence, an audit of the stratigraphical, geological and temporal evidence for the Ceratopsia (more than 70 species), had to be constructed. Drawing on numerous sources, the research team compiled a time-scaled phylogeny for all the known Ceratopsians. When each species of horned dinosaur lived was plotted against the geological timescale. In this way, a single chart could show which horned dinosaurs were contemporaneous. The Ceratopsia family tree (spring 2018). The picture (above), shows a time-scaled phylogeny for all the Ceratopsian species known at the time of compilation. Estimated temporal range of each species is indicated by the thick, black bars at the branch tips. This phylogeny was created using strap package for R. (Bell and Lloyd, 2014). From their Middle Jurassic origins, the evolution of the horned dinosaurs can be outlined in a single figure. Dinosaur fans can see which Ceratopsians lived at the same time as each other. They can also observe which horned dinosaurs are associated with the various faunal stages that make up the Jurassic and the Cretaceous. The very last horned dinosaurs include the likes of Nedoceratops hatcheri, Torosaurus latus and Triceratops prorsus, this information can be found towards the bottom corner of chart. Note how the two recognised species of Triceratops T. horridus and the geologically younger T. prorsus are not contemporaneous. This reflects recently published research (2014), that mapped changes in the Triceratops fossil population and the evolution of a new species as the genus changed over time. *The scientific paper: “Patterns of Divergence in the Morphology of Ceratopsian Dinosaurs: Sympatry is not a Driver of Ornament Evolution” by Andrew Knapp, Robert J. Knell, Andrew A. Farke, Mark A. Loewen, David W. E. Hone published in the Proceedings of the Royal Society B (Biology).